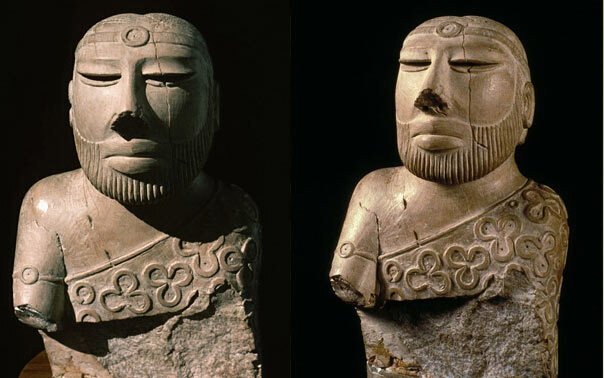 One the one hand, the priest-king of Mohenjo-daro may look like a real person; on the other, his garment and other signs led the archeologist Ernest Mackay to write, "the only stone image yet discovered which can definitely be said to be that of a deity is a white steatite head and bust, now about seven inches in height, but once much larger as the lower part of it is missing. This figure is clothed in a robe which is carried over the left shoulder and under the right arm, and on which is carved in relief the trefoil pattern that, to judge from its frequent appearance at Mohenjo-daro and Harappa, is obviously a sacred symbol. The figure has a short beard and shaven upper lip, in the latter fashion resembling other figures, both of gods and men, found in ancient Sumer. The hair, which is practically cropped, is parted in the middle and secured by a filet tied around the head, with two long ends hanging down behind. A hole bored on each side of the neck, just below the ear, is evidently intended to take the end of a necklace. The eyes are half closed and were formerly inlaid with narrow strips of shell, in which a cut roughly represented the partially concealed pupil. The lips are full, and the broken nose was probably of ordinary size. What do you think? God or man?